Yue-Lao, also known as the “old man of the moonlight”, is the God of marriage and love. He originated from the Tang Dynasty, and the story unfolded with a young man named Wei Gu encountering an old man reading a book under the moonlight. Out of curiosity, Wei Gu asked him what he was reading and the old man replied that he was checking the Book of Marriages. Wei Gu then probed what was contained in his bag. The old man explained that it was red strings and as long as this string is tied to the foot of a man and a woman, both of them would be husband and wife. Wei Gu promptly enquired the old man who his life partner would be, and the old man pointed to a three-year-old daughter of a blind woman and told Wei Gu that this girl would be his future wife. Not only did Wei Gu not believe this, he even hired assassins to kill the young girl! Years passed and after a series of incidents, Wei Gu came to realise that his wife was actually the daughter of the blind woman whom he had tried to kill years back. He was finally convinced by the words of Yue-Lao. 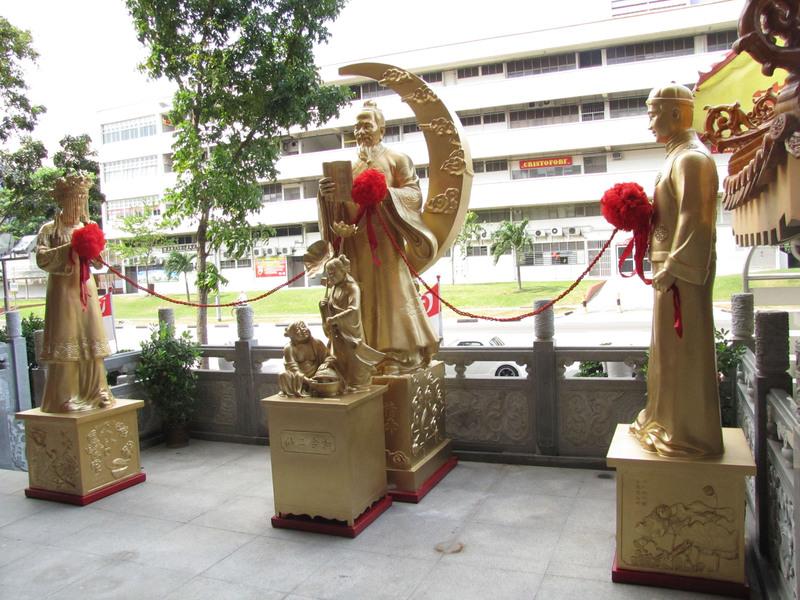 Since then, believers begin to worship Yue-Lao as the God of Marriage. When Yue-Lao ties a red string to a couple, regardless of them being arch enemies, in times of riches, poverty or how far both are away from each other, as long as the red string is tied, they will definitely be husband and wife. Hence the Chinese saying, ‘marriage of a thousand miles bond by a string’. Today, this red string legend still stands, and hopeful couples tying red strings, to enjoy everlasting love and a meaningful marriage. As for married couples, they can also pray to Yue-Lao for marital happiness. If a marriage is going through rough patches, praying to Yue-Lao will bring fortune and amicability to the family. Yue-Lao is known as the God of Marriage, and takes care of the marriages of all humans. As the Chinese saying, ‘marriage of a thousand miles bond by a string’. As Yue-Lao ties a red string on the foot of a man and a woman, they will end up together as husband and wife. This image illustrates the correct method of praying to Yue-Lao and hopefully, this will attract more of the younger generation to come forward to pray, and spread the Taoism culture to their next generation. Next, place your hands together in a gesture (refer to picture provided), together with the red string (compliments from our temple). Both hands to be placed in front of your eyes. Proceed to the female statue (for males) and the male statue (for females). Bring the red string in your hands to touch the foot of the statue. Tie the red string to the red rope that links the statue and Yue-Lao. If you find your life partner after praying, do bring offerings such as fresh flowers and fruits or cakes to give thanks to Yue-Lao. Put both of your thumbs on top of your ring fingers and rest your pinky fingers next to each other. Inter-cross your pinky finger, going through the ‘circle’ that your thumb and ring finger has created. Hold your pinky finger tight with the ‘circle’. Use your index and middle finger to hold on to the red string firmly.